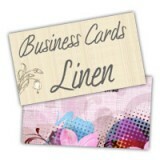 100LB Cover Uncoated Linen Business Cards. Superior Linen Cover allows your print products to gain a unique feel and texture. From enhancing the appearance of your business stationary to having exclusive printed material, 100 lb Linen Cover will certainly make a grand impression.